"The first aim of the instructor is to lay the foundation of the right attitude of his pupil towards the horse." "The horse will fulfill all desires of your heart; provided you honor, revere, and respect your horse." My basic theory to all equestrian endeavors is: Honor and respect our horses. Be easy to understand. Do not cause them pain, or confuse them. Let our actions cause our horses to relax when they are around us. With this philosophy enacted, we create the necessary environment in which our horses feel relaxed and protected. In this peaceful, unintimidating environment, horses are able to learn quickly. Loyalty and the unique friendship between species ensues. Remember: a friend is one whom knows, likes, and trusts you. Peace, development, and happiness are found in the company of friends. 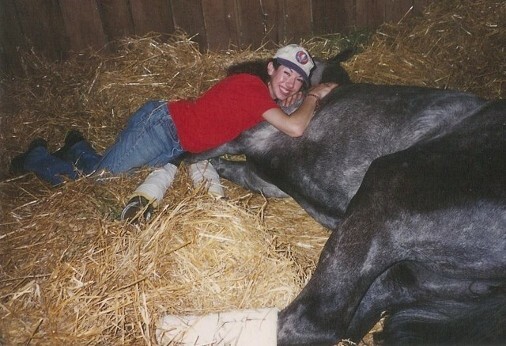 Photo of Orlean's Road, a young Thoroughbred stud colt, and Cassandra when she was a groom at Churchill Downs, at age 17. When I begged to groom this colt, the Assistant Trainer couldn't believe I WANTED to. This colt was attacking whomever was designated to groom him. All had been aggressive towards the colt in self-defensive and to gain entry into his stall. I offered a solution when I expressed an interest in the problematic youngster. I described how I would treat this stud colt: with honor and reverence. I wanted to give him a non-violent life. He later won prestigious races. His heart had been restored, along with his willingness to co-operate with people. He was my friend, and I, his. "Nothing on this Earth is to be prized more than true friendship." It is our actions, our philosophy, our beliefs, our attitudes, which shape our horses' behaviors. When we act in an easy to understand manner, with kindness and reverence for a horse's life and spirit, we EARN the horse's respect. Using our intellect, we can create a union in which the horse's strength and power is given to us by them, not taken from them through violent, or forceful means. We create an "eager-to-please" partner when we provide leadership, protection, and friendship. Photo of Wyatt's First; a three year old stud colt, and Cassandra. Here he is being softly introduced to being bathed. He arrived an un-started racing prospect, but already had caused extensive injury to a farrier. I teach equestrians how to execute the philosophy which has enabled me to handle these misunderstood horses. With this philosophy in place, healing occurs between horse and human, and problems are prevented. By breaking down the philosophy and attitude into smaller pieces, it becomes easy for someone to learn how to physically manifest these emotional key parts. I show how to act in a manner horses understand. This enables your good intentions to become tangible expressions all horses can clearly relate to. REVERENCE: Seeking to relate to the beingness of the horse, the essence of the horse...its spirit, its soul. Not just relating to the animal's exterior shell, or merely commanding obedience to your wishes. Reverence is engaging in a deeper, more meaningful interaction and honoring the life and spirit that is in the horse. HONOR: We must honor the horse, and hold our horses in high esteem for what they are: noble creatures of flight, grace, decision, and power. They all have inherent fears and desires. It is a great privilege to be in the presence of a horse. UNDERSTANDING: All horses UNDERSTAND other horses. A horse from Mexico can understand a horse from Russia. All people can become 'easily understood' by their horse, once they know the horse's language and how to use it. Please see the page titled, The Sacred Language. RELAXATION: When a horse feels safe and protected, their fears diminish. We need our horses relaxed for our safety. Even the most gentle of horses can be dangerous when panicked or frightened. When the survival instinct (adrenal response) is high; the reactivity level is high. Reactive horses can be balistic and can move faster than most people can ride. Homeostasis (balance) of the nervous system of the horse is required for human safety, and for top performance from the horse. The horse must be relaxed and comfortable in order to learn. Shared with me by legendary racehorse trainers, was the truth: only in the emotional state of relaxation, can the horse perform to its utmost. The fight or flight drive must be off to get peak performance. NO PAIN/FEAR/TENSION: Looking around, we see many tense and frightened performance horses, and could wrongly conclude that tension comes with performance. This not true. What is true is many horses perform under duress, despite the negative effects of tremendous tension, stress, and anxiety. However, we are not witnessing their full potential. The high prevalence of gastric ulcers in the majority of performance horses prove horses are not relaxed or content with their job, they merely endure their job. RESPECT: When we respect our horses, we create the safe horse, the gentle horse, the calm and willing horse, the relaxed horse. This is an opposite believe of many 'spotlight' trainers who preach, "Make the horse respect you." I have seen this fail upon all occassions, often the very cause of aggressive actions from the horse. "Making a horse respect you," is comparable to the belief that you can "make someone like you." I have learned RESPECT and AFFECTION must be EARNED. Please click on the page titled A Learning Story, to follow more of this example.